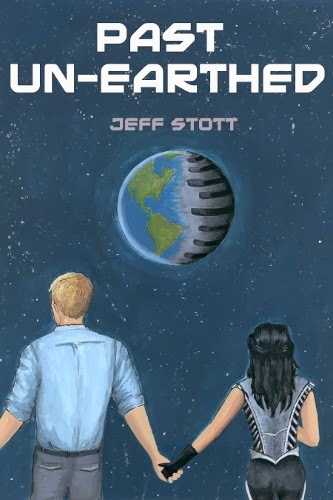 Jeff Stott, Past Un-Earthed. Self-published, 2012. Pp. 300. ISBN 978-1-3017-9957-2. $2.99. It takes a while for the penny to drop, but once it does, it’s a doozy. This is the story of two young people who met, fell in love and then had to face the consequences of their choices. On a relatively simple premise, Stott has built a moving and highly plausible science-fictional romance. Joshua is an Earth lad with stress-induced powers of strength and recuperation. Orphaned at fourteen and subsequently emotionally shut off from the world, he falls for beautiful Mari, and starts a wonderful romance, only to discover she has secrets, one of which is a pregnancy he had no hand in. Mari—or rather, Lara—is a naive girl from the planet Lateo, one of an advanced race, among which a devastating disease among the planet’s children is being blamed on exposure to Earth. In a high-powered political existence, Lara has her black-and-white preconceptions about politics and her father’s moral purity ripped away. Forced into marriage with the opposition leader, she flees to Earth. Once there, she strives to find the one member of the original exploration mission who stayed and fell in love with a ‘mere’ human. Instead she finds instead his reclusive son, and comes to realise that the most pervasive of ‘infections’ is this thing called love. This is a clever take on an alternative history prequel to a very familiar comic book superhero—the original ‘super’ hero, in fact. Stott makes use of Ancient Greek to justify the use of familiar names which will give the game away to some readers at once; those of Jor-El and Kal-El. Also the planet Lateo’s name in Greek is Krypton. Then there is the K-nite mineral that is the only weakness the Lateoians have… If you haven’t twigged yet, then this is a pleasing romantic novel, worth a read for an interesting and intelligent read in the speculative genre. If you have, then the pleasure is in how Stott runs with his theme and produces a very believable version of different events to what is comic book ‘canon’. This is a book about heroes: real ones, false ones and self-sacrificing ones. No-one dons a costume and cloak to be a hero, and thus it questions what makes a hero. Is Lara heroic in fleeing to Earth? Or is she just running away from bigger problems? Is Joshua a hero to carry on after losing both parents and his loving home? Or does he need to get out more and stop moping? Did his father act heroically to save his son, or did he also just run away, when his mother was more pro-active in shielding her son? Yet of the recognised ‘canon’ heroes, Jor-El is no hero, but a fascist bully, and the baby Clark Kent is no hero, as his fate is decided for him by his mother, instead of making the decision himself to become exiled to save another planet. The obviously heroic actions of Joshua in the final moments underline what, in fact, Clark Kent never had to worry about: self-sacrifice in the sure knowledge of death despite knowing that those he will help want to destroy him and his people. And his mother is a heroine for sending away her beloved son to save him from his father and from his people. Having strength and speed and physical inviolability does not automatically a hero make. So then we come to the core of the comic book hero’s strength: his homely moral health. His biological father is corrupt, greedy and cowardly to his core. His mother was naïve and gullible. His planet is self-centred and socially riven (between those who conform in the calm comfort of the city and the ‘Rebels’ in the forest). For all its faults, its social and personal decadence, Earth is the better place, with better people, because they acknowledge their selfishness, and the choice to live a moral life is the more laudable for the overcoming of baser emotions. Joshua’s story is the story of head and heart, while Lara’s is politics and drama. These become joined together through the human ‘weakness’ (as Lateoians see it) of involved love—yet it is in a ‘weaker’ state that the two become stronger. Through love of others, we come to know ourselves better. One feels that Clark Kent of the future, raised by the homely goodness of the Kents, owes also his spiritual health to the spectre of a ‘godfather’ in the form of Joshua, who helped his mother find the heart to be a woman of purpose. These are not new themes, and come up again and again in hero films and stories: how love is stronger than negative emotions, how a hero owes a debt to the influence of those around them, even if they stand alone. The book also works on the theme of insularity, and how it can lead to a misguided sense of superiority, and sense that can lead to a sense of permission for genocide. Earth becomes the scapegoat for Lateoian political manoeuvring and the blame for degradation in the purity of the planet’s people. Yet the ‘liberal’ figures in the story—Lara’s favourite university lecturer, her idea of her father to begin with—acknowledge the need for influence and change, and how contracting Earth’s ideas and languages has changed and widened how Lateoians think and act. The danger of insulating oneself against change and inevitable influence from outside one’s sphere—the decay and corruption of body turning in on itself—is clear from the example of the Lateoians. Again, no hero—no one—is an island. I will admit this book had me gripped. Although it has the underlying wholesomeness espoused by the Kents running right through it (this is not self-flagellating angst-drama fiction—leave that to Batman), it did not sink into the saccharine; which is a pretty neat trick. For once something honest and goodly, without being a prig of a book. I was interested in the characters, amused and intrigued by how familiar names played out in new ways, and satisfied by the conclusion; suitably epic in scope. I was tickled by the punning title, for the past of Superman is un-earthed, and he is also not of Earth; un-Earth(ian), as it were… ok, I thought it was neat. I felt it was let down by bad spelling in places, and by one or two glaring errors. One that made me wince—literally—came when Lara, defending herself from a drunken male human, grabbed his leg and squeezed till she crushed bone. She apparently grabbed his lower leg—yet somehow squeezed his femur (that’s your hefty thigh bone). The cover, too, looks less than professionally-produced for a book that is, despite minor errors, a well-rounded and intelligent read. It make seem pernickety, but when you are into the story, a glaring error, or a poor spelling, just made the otherwise professional quality of the narrative and book experience stumble.